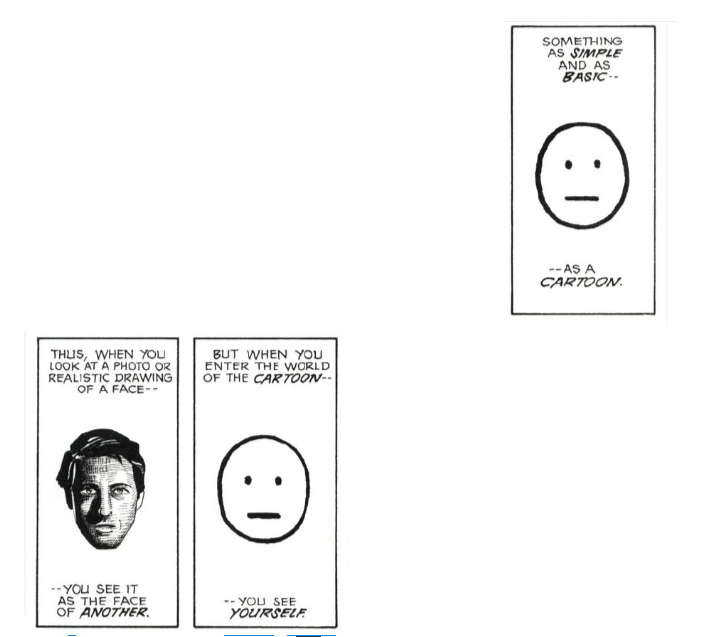 When reading Scott McCloud’s book Understanding Comics, it made me realize that comics is a artform, along with a type of literature, just as books are. There are many stereotypes regarding comics, such as they are children’s books or what I have fallen victim to believing, they cant convey any serious topics. After reading his book, I’ve realized that not only are the stereotypes about comics wrong, but that comics have the ability to convey information, or stories, that no other type of literature can. I hate reading, so when I was in middle school, and even some of high school, I would read graphic novels if I ever had to do the dreaded “book report”. However, what started as a way to make my book report “easier”, I realized that I actually really enjoyed reading them. Now my favorite book series of all time is a comic, Bone by Jeff Smith. The reason I believe this is because, graphic novels are often made using cartoons, and as Scott McCloud says in the book, “When you enter the world of the cartoon– you see yourself”. He is showing how the more distinctive or detailed a character is, the less people the character will look like. The way you can almost cast yourself into the character because of there simplicity, is the big reasons I enjoy comics/graphic novels so much. I read Understanding Comics using a e-book on a computer, however, when reading the printed version of it, I think it is a way better option then reading it online. When reading it online, it almost makes me feel as though the books art was made digitally, and not by hand. This is not the case when reading the book in the printed form. Secondly, it should be noted that I feel as though I have a harder time concentrating on the book when reading it digitally. This is not because of the other things on the screen at the same time, but because it takes away from the immersion when you have to constantly scroll down the page every 20 seconds to continue reading. For these reasons and more, I do not think it is fair to read his book digitally. What connects all the reasons that one should read the book in the printed form, is that this is how the author intended it to be read. Imagine watching a movie, but instead of watching it, you are looking at frame by frame pictures of the movie instead. If I was going to create a comic, I would make it a printed version as well. Turning the pages of a book “continues the story” or makes it flow in a way that scrolling on a computer can not capture.